Hey, Pengi: leave those kids alone. With Roger Waters playing the Wall at MTS Centre twice this week, I'm taken back to a simpler time in which I pirated the double album on then-state-of-the-art technology: cassette tapes. Dubbing cassettes was a boring business, so I'd make it more interesting by plugging a mic into the stereo and talking over the music: an earlier precursor to "the director's commentary" on DVDs. When I dubbed the cassette for my pal, Jason Beck, I turned on the mic right after the intro to "Vera," in which Roger Waters asks the musical question, "Does anybody here remember Vera Lynn?" 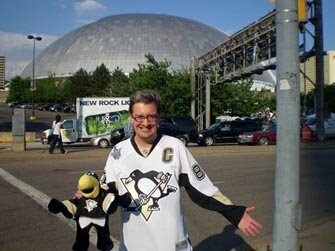 At the time, Beck had a stuffed penguin named "Pengi" (maybe he still does: see the creepy photo, below), so I said "Death to Pengi!" into the mic, ruining the song for him forever. Long story short: Beck will be in the Waters audience on Thursday night, and I'm looking forward to screaming "Death to Pengi" at the key moment, ruining it for him all over again. If you're in the audience on Thursday night, feel free to do the same. I think Pengi would've wanted it that way.